It’s no secret that I have a sweet tooth. Yesterday, when I posted my top 10 main dish recipes from 2015, it wasn’t very difficult to narrow the list down to 10 because I had hardly posted more main dish recipes than that. Desserts and sweet treats, on the other hand? I had SO MANY dessert recipes and it was quite a challenge to pick my favorites. These desserts are among the best of the best…the desserts that I can’t wait to make again (although I really am trying to be better about eating so many sweets! I don’t understand cooks that can make a treat and not eat them all!). I’ve already got a few sweet recipes waiting to be posted in the next few weeks, so I’m sure 2016 will be full of even more deliciousness! 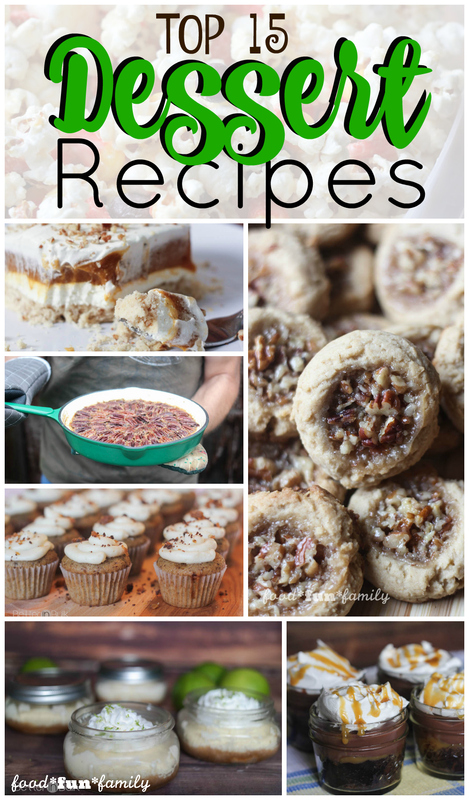 Without further ado…here are my top 15 dessert recipes posted on Food Fun Family in 2015. What kinds of desserts do you like best? What types of recipes would you like to see more of on Food Fun Family in the coming year? I’m hoping to do TONS more cooking and baking and experimenting with foods this year. I can’t wait to share! Love “best of” recipe round ups? Then be sure to check out my previous lists of TOP recipes from the past few years.